Indianapolis Jiu-Jitsu is ahead of the curve! The Indiana Brazilian Jiu-Jitsu Academy just celebrate 14 years, in business! 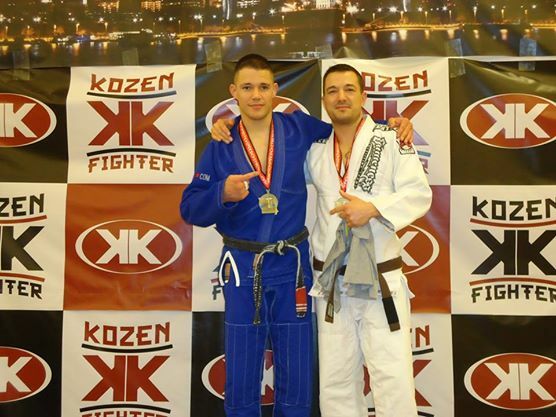 To celebrate being the LONGEST RUNNING Indianapolis BJJ/MMA Academy, Coach James Clingerman competed at the Kozen Fighter Missouri State Championships. Professor Clingerman is a 2nd Degree Black Belt, one of the Highest ranking Coaches in the Indianapolis area. He is one of the ONLY active Black Belt competitors out of Indianapolis. Not only did Professor James Compete and win against an experienced Jiu-Jitsu Black Belt, but Coach Mat Stratta placed 2nd in the Brown Belt division! This was Coach Stratta’s first tournament in 4 years. He lost to one of the most active competitors in the US, in Tyler Bishop from Gracie Humaita. Indiana Brazilian Jiu-Jitsu Academy is the Top Indianapolis Jiu-Jitsu Team, winning the Extreme Grappling Open‘s TEAM OF THE YEAR in both Gi (uniform) and No-Gi (without uniform) 5 years in a row! If you would like to train and you would like to train at an ACADEMY with a PROVEN system with PROVEN results, look no further. The Indiana Brazilian Jiu-Jitsu Academy is THE PLACE!